Home › "Eagle" Electric Pencil Sharpener - Heavy Duty Helical Blade- Medium Use Moto..
"Eagle" Electric Pencil Sharpener - Heavy Duty Helical Blade- Medium Use Moto..
Professional automatic pencil sharpener with heavy duty helical steel blade perfect for everyday use. "eagle" is a Socially Conscious Brand- $1 From Each Sale Goes to Philippines Castle Orphanage, Trinity Children's Home- A Foundation for Faith, Hope & Love, Inc. Reliable with its easy to clean shavings tray and non-skid rubber feet. Swift and impressive with overheat protection. Perfect for Kids with its built-in safety cut-off feature activated when receptacle is removed. Tough Electric Sharpener for Classroom, School, Office, and Home use. AC powered with 120V Adapter. 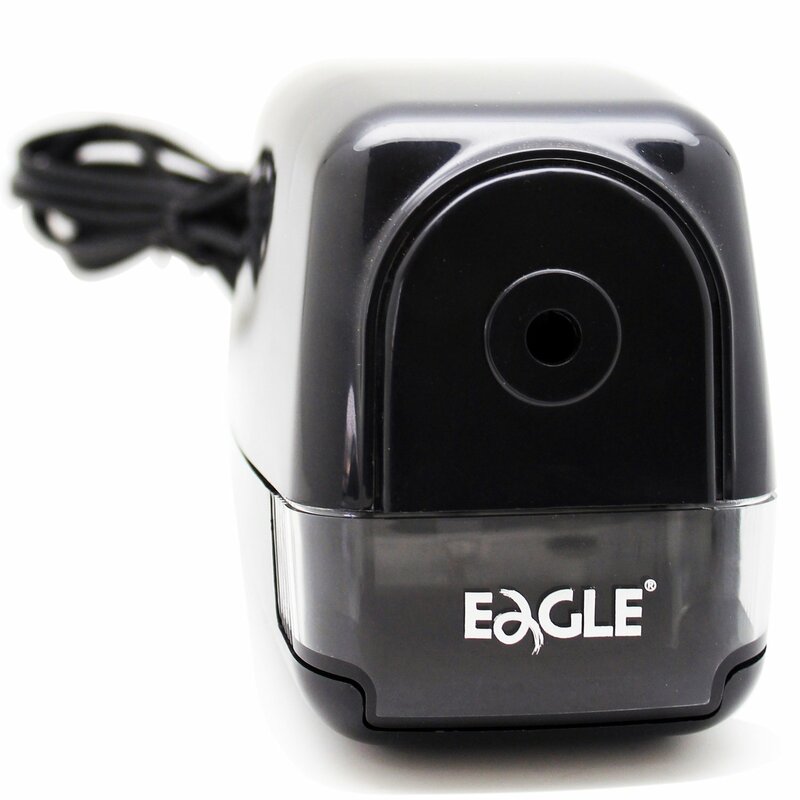 Introducing Compact "eagle" Electric Pencil Sharpener! A SOLID evolution toElectric Pencil Sharpeners! FASTER. SAFER. STRONGER. Designed with heavy dutyhelical blade that sharpens regular multi-sized wood, composite, and recycledpencils, it doubtlessly tolerates abuse! You also save time as it sharpensbrand new pencil to perfect point in 8seconds! Spare yourself the headachewith its easy to clean shavings tray and non-skid rubber feet. This single-hole compact electric pencil sharpener with its firm and stable make-up isexcellent for everyday use. Safe and reliable than most pencils with itssturdy feature, it also has a built-in safety switch and motor that protectsfrom overheating. Perfect for kids with its automatic cut-off featureactivated when receptacle is removed. Don't want loud squeals? It's quieterthan other models at only 76dB. Not all products have a heart...but WE do. $1from each sale goes to Philippines castle orphanage for Street Kids: TrinityChildren's Home-A Foundation of Faith, Hope, and Love, Inc. We are so proud ofour amazing product that we offer a no questions asked, money back guarantee!What are you waiting for? Go click "Add to Cart" and consider getting one eachfor home, office, and classroom!